What has happened with Gmail? I have been using it for quite a while and loved it because there was virtually NO SPAM entering my mailbox. It all went into the SPAM folder, and good email did not. Now things have changed. I have started getting two or three SPAM messages a day. Does anyone know what has changed with Gmail? This mysterious ad has suddenly appeared on the Internet. So far, no one has claimed authorship. It’s not about Hillary. It’s not about Obama. It’s about the end of the mainstream media. Illegal Drug Users Are Not Patriotic and Loyal Americans. While brave and fearless American soldiers are fighting and dying in Iraq and elsewhere to protect their fellow countrymen from murderous Islamists, some other Americans, users of illegal drugs, are sending American dollars abroad where their money ends up funding those same terrorists that our soldiers are fighting against. 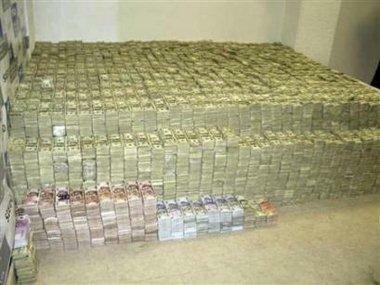 Reuters – Fri Mar 16, 2:38 PM ET: “A haul of about $206 million U.S. dollars after it was found stashed in closets, suitcases, and drawers in a house in an upscale neighbourhood of Mexico City, March 15, 2007. (Procuraduria General de La Republica/Handout/Reuters)”. Just another one of those endless comments entered here about our peaceable northern neighbor: “Canada had the good sense to stay out of the Vietnam war.” God bless Canuckistan and please, God, save the world from any more of her peacekeeping efforts! Oh Yes – that is what Canadians believe, that they had the “Good $en$e” to stay out of the Vietnam War. However, … history tells the story differently. Although Canada didn’t send Canadian fighting forces – Canada sent a lot of other things – like war materiel that didn’t go directly to Vietnam, lest Canada’s ruse be discovered. In fact, Canada was so busy manufacturing war materiel for the American forces in Vietnam that the entire country was booming like a well-oiled machine. And the Canadian government had the “good $en$e” to not tell its citizens just why the country was basking in economic good fortune, with unemployment below 4%, instead letting them believe that the manna falling from the heavens was their reward for being good little peacekeepers. During the Vietnam era, Canadians were too busy protesting the US involvement in Vietnam to make any efforts to discover their own country’s super secret role in the production and testing of Agent Orange, a weapon that would harm thousands of innocents. The government and manufacturers were claiming that they were shipping an everyday common herbicide that Canadians used to kill weeds in home gardens, under power lines and along railroad tracks. Even though it would wipe out entire jungles in Vietnam, Canadians were told that it was perfectly safe for people, and never, ever did the name of the herbicide, “Agent Orange” pass from their lips. Oh yeah – Canadians had the “good $en$e to stay out of Vietnam” by selling the Agent Orange to the US army, which at the time was involved in Vietnam. Since it was American planes that sprayed the Agent Orange, wiping out thousands upon thousands of acres of trees and crops in Vietnam, Canadians could continue to live free and guiltless. The fact that Agent Orange was more than a harmless herbicide, that it contained poisonous dioxins, was an American failing, and no fault nor moral problem for the Canadian manufacturers, … whose government leaders had had the “good $en$e” to financially profit from the Vietnam War, instead of fighting in it. You are currently browsing the Kerfuffles and Flourishes blog archives for March, 2007.